There's something about loading up the car, putting on some awesome tunes, and hitting the open road that appeals to everyone — young or old. It's the sense of freedom, the promise of fun times, and the relative ease that has made road-tripping one of the great American traditions. Every year when the snow melts away, families, groups of friends, and solo wanderers take to the highways for a big adventure. 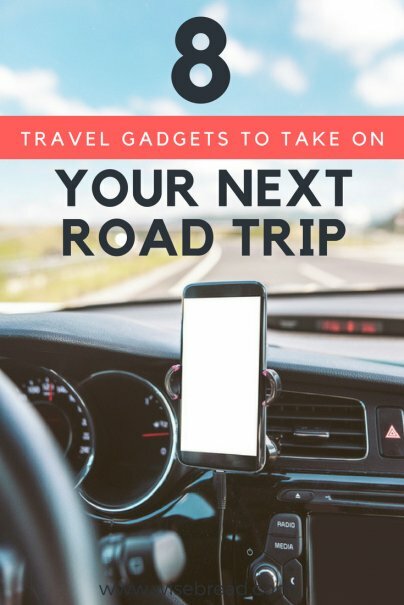 Having the right gadgets with you can take your road trip to another level, whether they're for practical use, entertainment purposes, or things to keep you safe on your journey. But sometimes it's difficult to know what to pack, and what's just going to add extra weight to your vehicle. Here are eight travel gadgets you should take on your next road trip. If you're going to be using your smartphone as a GPS navigation system or music player in your car, you need to do it safely, and installing a smartphone mount is the way to go. There are several that are suitable for any model of car, whether it uses a suction cup for the windshield or a clip for the air vent. Just make sure it's in a place that's easy to see, but doesn't obstruct your view of the road. When you're on a road trip, you're probably going to want some entertainment, both for the actual traveling and for when you've parked at each stop along the way. A Bluetooth speaker will allow you to sit around the campfire or in the hotel room listening to your favorite playlists and podcasts. If you're driving a car that lacks built-in USB ports, then a USB charger that fits into the cigarette lighter is the ideal fix. You can use it to charge all of your devices while you're on the go; particularly your smartphone, which will quickly run out of juice if you're using satellite navigation. Give yourself some peace of mind in the event of being involved in an accident when you're on a road trip with a second set of eyes. Though it's not something you ever want to happen, it pays to be prepared, and a dashboard camera can help prove the exact circumstances of a crash. Increasingly, people are also using them to capture the scenery around them while driving that they wouldn't otherwise be able to document. Choose one with a higher memory capacity and you could make an incredible time lapse film of your entire journey once you get home.